The Honda Pilot and its rival the Toyota Highlander helped to define the market's expectations for midsize crossover SUVs. The second-generation pilot is larger and more distinctively styled than its predecessor was. A standard 3.5L V-6 coupled to a 5-speed automatic is the sole power train. The Pilot features an interior that is larger than the Toyota Highlander and equivalent to GM's significantly larger (on the outside) and heavier crossovers. Cylinder deactivation technology allows the Pilot to turn in a respectable 17/23 MPG for FWD models and 16/22 MPG for AWD models. 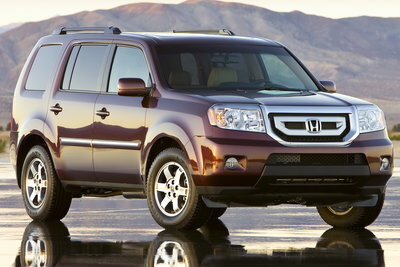 Honda offers the Pilot in LX, EX, EX-L and Touring trim levels. The new Touring model features a standard navigation system, memory settings for the driver's seat, an upgraded 512-watt stereo, and a power-operated tailgate. The second-generation pilot is larger and more distinctively styled than its predecessor was. The Pilot has grown longer by about 3 inches, wider by 1 inch and taller by 1 inch. The increased size has only added about 100 lbs of curb weight. The increased length has added some badly needed legroom to the second and third row seating with increases of 1.1 inches and 1.9 inches. However, headroom, shoulder room and hip room are virtually the same or reduced. There are 3 cubic feet more storage capacity behind the third row, more if the in-floor storage compartment is in use. Storage capacity is about the same with the third or second row seating folded. The displacement of the V6 is unchanged, but the engine now produces 250-bhp and 253 lb-ft of torque up slightly. Fuel economy has increased across the board. The Pilot is now rated at 17/23 for FWD models and 16/22 for AWD models.